The population of Kunkletown's ZIP code in the 2010 census was 9,464, of whom 8,924 were Caucasian, 377 were African-American, 499 were Hispanic, 81 were Asian, 77 were Indian, 9 were Hawaiian, and 161 were of other races. The average home value in 2000 was $114,800, and the average household income that year was $44,580. ^ a b c "Kunkletown, Pennsylvania". Geographic Names Information System. United States Geological Survey. ^ Rupp, I. Daniel (1845). History of Northampton, Lehigh, Monroe, Carbon, and Schuylkill Counties. Via Rowland, Bob (August 21, 2004). "The Kunkles in Kunkletown, PA". Ancestry.com. Archived from the original on March 24, 2012. Retrieved March 24, 2012. 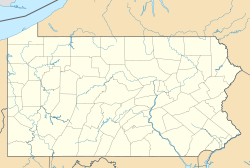 ^ "Kunkletown, PA". ZIP-codes.com. Retrieved March 24, 2012. "PA Home Town Locator". HTL, Inc. Retrieved March 24, 2012. Thomas, Daniel. "Attractions Near Kunkletown, PA". Demand Media via USA Today Travel. Retrieved March 24, 2012. This page was last edited on 1 December 2018, at 00:28 (UTC).